In 4 Training will develop participants skills and knowledge necessary to provide first aid response; life support; management of casualty(s); the incident and other first aiders until the arrival of medical or other assistance. The Nationally Accredited 1st Aid course provided by In 4 Training (HLTAID003 – the most current First Aid course) teaches participants the necessary skills to administer first aid care that may be required in emergency situations, as well as the tools needed to help treat serious injuries and other ailments. Refresher courses are also available at IN 4 Training. If you only require CPR certification? The CPR qualification is covered in the first 2 hours of the normal First Aid course – as per the dates and locations listed. 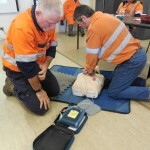 Those required by industry to act as First Aid Officers are may be deemed necessary under work health legislation.Those that are likely to come across accidents/incidents; who wish to learn first aid skills which may useful for employment purposes; who are interested in helping to promote health and well-being in the community. New to be parents who are concerned about what to do if your child is hurt. Almost every work place requires their team members to be first aid qualified. Local football / soccer / Netball club. There is no pre requisite for provide first aid or CPR. 1 x 10 hour day. The course is delivered is face to face. Some suggested pathways to further your emergency response capabilities. Provide cardiopulmonary resuscitation HLTAID001 certification is valid for 12 months.